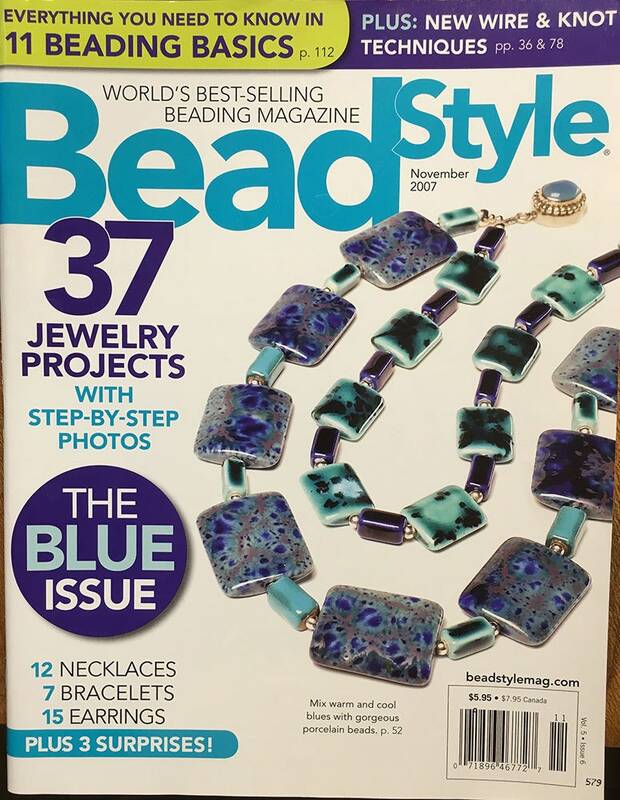 In this November 2007 issue of Bead Style Magazine you will find a Everything you need to know in 11 beading basics, 37 jewelry projects with step-by-step photos, the Blue Issue with 12 necklaces, 7 bracelets, 15 earrings and 3 surprises, plus new wire and knot techniques. Projects include: Mix cool and warm tones in contrasting blues; no such thing as too many earrings - an exclusive preview of 365 Earrings; Make a tailored necklace and bracelet with barbell beads; whip up glass-bead ornaments for Holiday Cheer, Create a cool patinated copper necklace bracelet and earrings in blue mode; simple elements shine in a contemporary modern take on blue; lamp work bead bracelet; embracing a natural selection - a fall necklace that could be plucked from the forest floor; Create subtle accents with knotted cord; Knot earthy accents and aqua beads in a casual necklace, bracelet and earrings; Chandelier earrings with assorted blue crystals; Simply wrapped flexible beading wire and hole-less beads; use the blue crystal options to create a multihued necklace. And more!